We’ve all met them – those brilliant individuals, brimming with cutting-edge and original ideas to eliminate war, poverty, famine and a host of other earthly concerns forever. I think of them as the Don Quixotes of the business world, swinging at just about anything that moves or breathes. Unfortunately, most of these poor souls and their ideas vanish as fast as they appear. The fact is that the best disruptive ideas and visions in the world mean nothing if there is no organization to implement them or if an organization is incapable of meeting the demands of a disruptive strategy. Every company—disruptive or otherwise—lives and dies by the ability of its employees to consistently plan and execute on a daily basis as well as over much longer time periods. Strategic planning, accountability, and performance tracking as well as decision-making are a few of the organizational best practices that should be in place by the time a company begins operations. Work flow processes follow close behind, especially as they relate to receiving and making payments (e.g., AR and AP), product development, sales and marketing, etc. 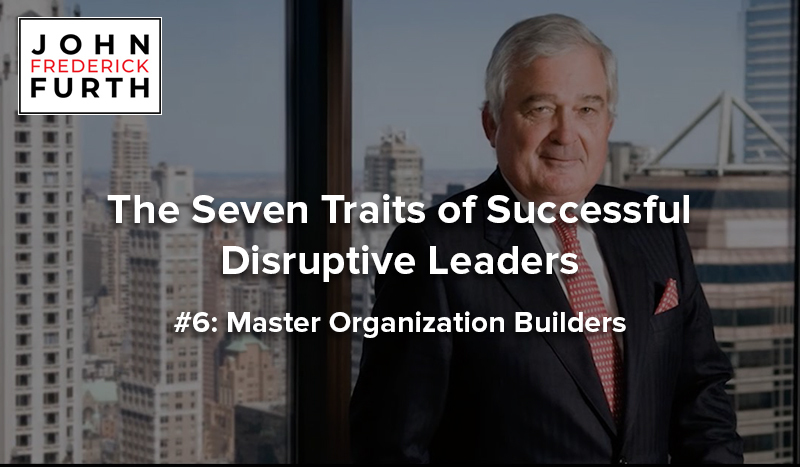 Lou Gerstner became a highly respected leader with a deep understanding of organizations, especially in business, early in his career. And when he was brought in from the outside to turn IBM around in the early 1990’s, he had already successfully run two large, global enterprises. Gerstner wasn’t an entrepreneur and spent his entire career as an employee – even if he was an extremely highly paid one. He had also never run a technology company before. That said, I include him on the list of great disruptive business leaders, because he was hired to dramatically change the course his predecessor had taken while at the helm of one of the world’s largest and most important companies. This failed strategy had resulted in a vast array of products that were either mature or lackluster. IBM was hemorrhaging money and was perilously close to bankruptcy. The role that Gerstner accepted as CEO was very risky and success was anything but ensured. Gerstner knew from his previous roles that the biggest problem major companies faced in 1993 was integrating all the separate computing technologies that were emerging at the time. He realized that IBM’s unique competitive advantage was its ability to provide integrated solutions for customers—a company that could represent more than piece parts or components. Like all great disruptors, Gerstner literally forced IBM to become a customer-centric company. And like many other successful disruptions, there was also a lot of short-term misery. Gerstner laid off more than 100,000 employees which in short order killed one of IBM’s holiest cows: the promise of lifetime employment. Many other archaic organizational and culture artifacts were disrupted and discarded in short order. Gerstner’s disruption of IBM was a resounding success, at least for a few years. From 1993 until Gerstner’s retirement in 2002, IBM’s market capitalization rose from $29 billion to $168 billion.